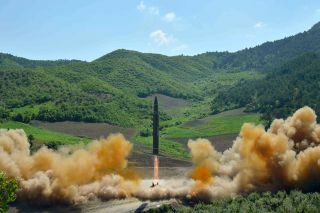 This July 4, 2017, file photo distributed by the North Korean government shows what was said to be the launch of a Hwasong-14 intercontinental ballistic missile (ICBM) in North Korea's northwest. North Korea launched another ICBM on Nov. 28, 2017, showcasing the apparent ability to hit the U.S. East Coast. The missile that North Korea lofted on Tuesday (Nov. 28) splashed down about 620 miles (1,000 kilometers) from its launch site, after flying for 54 minutes and reaching a maximum altitude of about 2,800 miles (4,500 km), according to media reports and statements from Pentagon officials. "This is significantly longer than North Korea's previous long-range tests, which flew on lofted trajectories for 37 minutes (July 4) and 47 minutes (July 28)," added Wright, a senior scientist at the Union of Concerned Scientists, a science advocacy group in Cambridge, Massachusetts. "Such a missile would have more than enough range to reach Washington, D.C., and in fact any part of the continental United States." Rockets and ballistic missiles share a common past. See how ballistic missiles work in our full infographic. But this doesn't necessarily mean that the entire U.S. mainland is now vulnerable to a nuclear attack by North Korea (which has repeatedly threatened to destroy the United States, South Korea and Japan), Wright added. "We do not know how heavy a payload this missile carried, but given the increase in range, it seems likely that it carried a very light mock warhead," he wrote in the blog post. "If true, that means it would be incapable of carrying a nuclear warhead to this long distance, since such a warhead would be much heavier." North Korea has been working for years to develop an ICBM, a missile that can travel at least 3,400 miles (5,500 km) from its launch site.